An explosion can result from an ignition of a combustible gas, mist or dust when mixed with air during processing, handling or storage operations. A rapid rise in pressure occurs in the containing structure, and if it is not of adequate strength to withstand the deflagration pressure, extensive damage and injury to personnel can occur. Explosion vents are low burst pressure membranes of calculated area fixed over an opening on the structure to be protected. In the event of a deflagration the vents provide a rapid and unrestricted opening at a predetermined burst pressure (Pstat) allowing combustion gases to expand and flow through the open vent. The required relief area necessary to protect plant or equipment may be determined by using the most current standards of NFPA 68 or VDI 3673. The most suitable explosion vent may be selected by matching the information in this catalog with the particular operating conditions. The Vent-Saf® explosion vents can protect industrial equipment including silos, dust collectors, cyclones, conveyers, dryers…and many more. 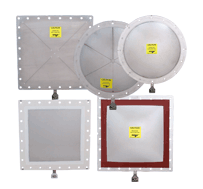 Types VSP™ (Vent-Saf Plus) and VSS™ (Vent-Saf Sanitary) domed single section metal explosion vents with integral gaskets. The dome is formed to resist vacuum. Type VSE™ (Vent-Saf Economy) a flat, single section metal explosion vent with integral gaskets. Type EXP/DV™ a round domed explosion vent of composite construction with integral gaskets. The EXP/DV vent has a laser cut stitch pattern in the dome area. A Teflon® liner covers the slits providing a seal. The vent burst pressure is controlled by the arrangement of the stitch pattern. The Vent-Saf vents are available in both round or rectangular styles designed to be mounted on the structure to be protected using a Safety Frame. Unique, economic and patented design. Accurate reliable and leak tight. One-piece metal construction without slits on the process side avoiding product accumulation. Optional design for aseptic/sanitary applications. No fragile PTFE seal that may puncture and admit moisture. Superior dynamic performance due to low mass compared with composite designs. Operating pressures up to 60% of the minimum tagged pressure rating (80% under certain conditions). Thermal insulation available to permit use in operating temperatures to 2000°F/1093°C, to reduce heat loss or prevent condensation. Supplied with integral gaskets ready for installation. Fail-safe design, if damaged it will provide a relief opening below its rated pressure. The items to consider in selecting and ordering an explosion vent. For an Application Data Sheet listing required information contact BS&B. Positive burst pressure (Pstat) at coincident temperature. Normal operating pressure and temperature. Maximum operating pressure and temperature. Process media compatibility with materials of vent. Frames (bolted, welded); panel bolt pattern, BS&B standard or special, please specify. Optional magnetic burst sensor (specify if armored cable or factory installation of switch on frame is required). Burst Pressure (pstat): Burst pressures are available from 0.3 psig (0.021 barg) to 5 psig (0.35 barg) depending on vent size and configuration. Vacuum Service: The VSP and VSS vents with their domed constructions are designed to resist high vacuum under cycling conditions without the need for vacuum support bars attached to the inner safety Frame. The vacuum rating of a vent is dependent on the vent’s burst pressure, consult BS&B Safety Systems, Inc or BS&B Safety Systems, Ltd.
Service Capabilities: The VSP vent has been tested to over 1 million pressure cycles from vacuum to light positive pressure while retaining its burst accuracy. The VSP vent exhibits superior performance compared to conventional composite vents that fatigue after less than 40,000 pressure cycles under equivalent test conditions.The type VSS vent is of similar construction to the type VSP vent and is suitable for static or cyclic vacuum service conditions only. Burst Pressure (pstat): Burst pressure is available from 0.25 psig (0.017 barg) to 5 psig (0.35 barg) depending on vent size. The VSE vent will burst at the same pressure in both directions. Vacuum Service: The VSE must be installed in a Safety Frame with vacuum support bars in order to withstand vacuum or back-pressure. Service Capabilities: The VSE is designed for atmospheric, or static pressure service conditions. Round VSE VENTS. There are two standard designs providing a one petal or four petal shape relief openings. The four-petal design offers high burst pressure. Operating Pressure: The VSP, VSS and VSE vents are suitable for positive pressures up to 60% of the minimum burst pressure. However , under certain conditions up to 80% of the minimum burst pressure is possible. Consult BS&B Safety Systems, Inc.
Vent Operation: The perimeter of the rectangular or square vents are laser cut on three sides in a stitch pattern. The fourth side acts as a hinge, and retains the central section, controlling fragmentation upon opening of the vent The laser cut slits in the vent are covered by integral gaskets or sealing material to achieve a leak tight sealed construction. Materials of Construction: The VSP, VSE and VSS explosion vents in 316SS* standard material are available with a variety of gasket and seal materials depending on the application. For economy half silicone sponge gaskets are provided as standard which cover half the flange to the bolt holes. Full gaskets may be supplied on request. Alternative gasket materials including Neoprene and Solid Viton® are also available. *Vents are available in alternative materials. ‘Silicone sponge component acts as a gasket/seal and is fitted to both sides of the vent. An alternative tolerance of +/-0.25 % may be offered if required by the customer, contact us. The tag is affixed to the discharge side of the vent will be marked with a minimum-maximum burst pressure range. The dimensions and relief areas of VSP and VSE vents in either rectangular or round designs are given in Tables 1 and 2. Contact BS&B Safety Systems, Inc. or BS&B Safety Systems, Ltd. for non-standard sizes. Rectangular vents can be mounted in lightweight angle profile Safety Frames. Round vents can be installed between standard weld neck flanges in accordance with ANSI 150 or DIN PN10 or in lightweight angle profile frames. Safety frames are available in 304SS or carbon steel. The frames are designed to either bolt or weld on to the equipment to be protected. If frames are manufactured by the user, details of bolt sizes, spacing and dimensions must be given to BS&B Safety Systems, Inc. prior to vent manufacture to ensure correct vent performance. The standard explosion vent may be used in temperatures –40°F to 300°F (-40°C to 150°C), the sanitary/aseptic design –80°F to 450°F (-62°C to 232°C) and with solid silicone gaskets the RTV (High Temperature) seal –80°F to 500°F (-62°C to 260°C). Alternative vent construction permits higher temperatures. These explosion vents of single section stainless steel construction with smooth internal surface finish are free of cavities. Solid White silicone gaskets are supplied fitted to the vent flange area and FDA approved RTV sealing material applied to the vent perimeter to achieve a sanitary/asepticconstruction. Thermally insulated vents using either urethane or ceramic material may be offered to prevent heat loss or condensation on the vent. Insulation will also permit their use in high temperature service up to 2000°F (1093°C). The insulation is integral to the panel construction, requiring no additionalfield installation. The type and thickness of the insulation material will be selected to suit the operating temperature requirements. The additional insulation is taken into consideration when the burst pressure is determined. An optional stainless steel weather cover is available to provide added protection of the insulation against rain, ice or debris. The MBS™ Type magnetic sensor is available to provide immediate warning upon bursting of the explosion vent. A magnetic activator is fitted to the vent and a proximity switch attached to the safety frame. Warning of a burst vent is given when the current flowing through the sensor is disrupted giving an open circuit signal. The sensor is suitable for use in hazardous areas provided a suitable power level or Zener barrier is used to meet intrinsically safe requirements. An armored style sensor is also available. Type EXP/DV Vent is a round domed vent of composite construction laser cut in a stitch pattern in the done area. An FEP/PTFE liner covers the slits providing a seal. The vent burst pressure is controlled by the arrangement of the stitch pattern. Burst Pressure (pstat): From 1 psig (0.07 barg) and above depending on size.Sizes: 6" (150 mm) to 48" ( 1200 mm) relief diameter. Vacuum Service: The EXP/DV vent is fitted with a vacuum support to resist high vacuum. Service Capabilities: The type EXP/DV vent exhibits good performance under pressure cycling conditions from vacuum to light positive pressure. Burst Tolerance: The Burst Tolerance is +/- 0.5 psig (0.034 barg) of the nominal burst pressure. A tag is fixed to the discharge side of the vent and marked with the burst pressure range. Example: A vent with a nominal burst pressure of 3 psig (0.21 barg) will be tagged minimum 2.5 psig ( 0.17 barg) - maximum 3.5 psig (0.24 barg). Materials: The top or burst control section and the vacuum support are 316SS. The seat is Teflon. Other top section and seal materials are available. Operating Pressure: The EXP/DV vents are suitable for positive operating pressures up to 80% of the minimum burst pressure. Example: A vent with a nominal burst pressure of 2.5 psig (0.17 barg) is suitable for operating pressure up to 2 psig ( 0.138 barg). Installation: The EXP/DV vent can be installed between standard weldneck flanges in accordance with DIN PN 10, ANSI 150 or directly on to the structure to be protected. The vent must always be installed with a hold-down ring on the outer side to ensure proper performance. The vents are supplied with gaskets ready for installation. Operating Temperature: -40°F (-40°C) to 500°F (260°C)Thermally insulated vents using ceramic fiber material may be offered to prevent heat loss or condensation on the vent or to permit their use in high temperature service up to 2000°F (1093°C). The EXP/LCV vent is a rectangular flat vent of composite construction laser cut in a stitch pattern around the vent’s perimeter. Vacuum Service: The LCV vent is fitted with a support to resist vacuum. Burst Pressure (pstat): 0.5 psig (0.035 barg) to 5 psig (0.35 barg), depending on size, and in the same sizes as types VSP and VSE vents. Service Capabilities: The type EXP/LCV vent is designed for static or light pressure cycling duty. Burst Tolerance: The Burst Tolerance is +/-0.25 psig (0.017 barg) of the nominal burst pressure. Tags are marked with a min/max burst range. Materials: The top section is 316SS with a Teflon seal. Other top section materials are available. Operating Pressure: The vents are suitable for operating pressures up to 60% of the minimum burst range. For technical assistance on any explosion vent contact BS&B Safety Systems, Inc.